Kaija Saariaho (Finland 1952) studied composition in Helsinki, Freiburg and Paris, where she has lived since 1982. Her studies and research at IRCAM have had a major influence on her music and her characteristically luxuriant and mysterious textures are often created by combining live music and electronics. Although much of her catalogue comprises chamber works, from the mid-nineties she has turned increasingly to larger forces and broader structures, such as the operas L’Amour de loin and Adriana Mater and the oratorio La Passion de Simone. For this program Saariaho’s composition for solo cello ‘Sept Papillons’, will be performed by Ted Mook. A dramatic departure from the opera ‘L’Amour de loin’ in both scale and substance, the piece uses the the delicate sounds of harmonics to produce an ephemeral mood. For more than 40 years, baritone Thomas Buckner has dedicated himself to the world of new and improvised music. Buckner has collaborated with a host of new music composers including Robert Ashley, Annea Lockwood, Roscoe Mitchell, Phill Niblock, Christian Wolff and many others. He has made appearances on various events worldwide and is featured on over 40 recordings, including 6 of his own solo albums. He was also founder of the legendary 1750 Arch Records and created the Mutable Music record label to produce new recordings and reissue some important historic recordings. Buckner has received a Letter of Distinction from the American Music Center, and an award from The Kitchen for his many contributions to contemporary music. In a career which spans nearly 4 decades, Joan La Barbara has carved a unique niche for herself as a fearless vocalist and experimental composer, pioneering the field of what has become known as “extended vocal techniques”, creating an array of works for solo voice, chamber ensembles, music theater, orchestra, soundscores for film, video and dance, and utilizing interactive technology. She has worked with other composers as Morton Feldman, Robert Ashley, John Cage, Steve Reich, Philip Glass, generating a body of new pieces focusing on her abilities. Releases of her solo work and collaborations got spread worldwide on established labels as Deutsche Grammophon, Nonesuch, New Albion, Lovely Music. The piece ‘Gatekeeper’ that she’ll perform on this event, draws on sources to weave a solitary journey through the mysterious labyrinth of the mind, exploring the artistic process of bringing the essential internal struggle to fruition as a perceivable object. David Behrman (Austria, 1937) has been active as a composer and artist since the 1960s. Together with Robert Ashley, Alvin Lucier and Gordon Mumma, Behrman founded the now legendary Sonic Arts Union in 1966. He has had a long association with the Merce Cunningham Dance Company as composer and performer and has created music for several of the Company’s repertory pieces. During the 60’s Behrman was also producer of Columbia Records’ series ‘Music of our time’ which presented works by influential composers as Cage, Pousseur, Reich, Riley, Tudor, Stockhausen. Over the years he has made sound and multimedia installations for gallery spaces as well as compositions for performance in concerts. Most of his pieces feature flexible structures and rely on interactive real-time relationships with imaginative performers. My Dear Siegfried, Leapday Night, On the Other Ocean, Interspecies Smalltalk and Long Throw are among Behrman’s works for soloists and small ensembles. Recordings of his works have been published by Lovely Music, Experimental Intermedia, Alga Marghen. Behrman’s sound and multimedia installations have been exhibited in various galleries and museums. He received numerous grants and awards by different foundations worldwide. For this occasion Behrman together with Joan Labarbara, Thomas Buckner and Ted Mook will perform three pieces from ‘My Dear Sigfried’: ‘A Soldier’s Declaration’, ‘My Father’s Grocery Store’, ‘Watercress Well’. My Dear Siegfried is a music piece combining historical texts, vocal and instrumental (cello, guitar) performance and interactive software running on a laptop. Theodore (Ted) Mook (USA 1953) is an American cellist and has been an active proponent of new music, particularly microtonal music since 1980. 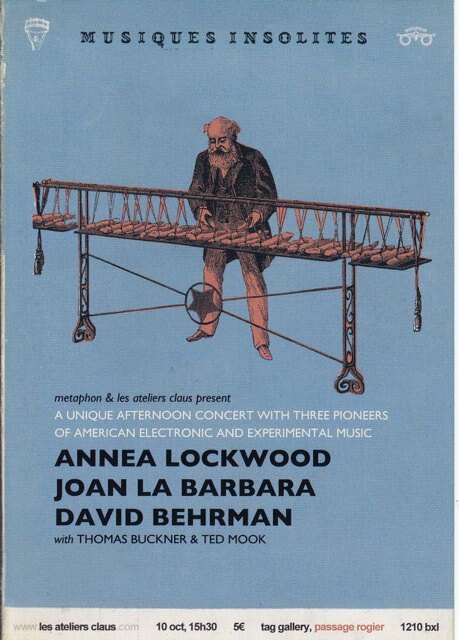 As a member of Newband he performed on the original instruments of Harry Partch. Moving to New York in 1983 he has premiered works by a.o. Chen Yi, John Zorn, Daniel Rothman, Lee Hyla, Ezra Sims, David Lang. Since the mid-1990s, Mook has developed a career in computers, where he has worked in IT & programming for corporate clients, developed fonts for microtonal compositions, developed websites and worked as a music copyist and arranger.